How Much Compensation For Slipping On Wet Floor Claim? Wet floor injuries are very common. They can happen almost anywhere and can cause serious injuries. What happens when you slip on a wet floor? Wet floors are dangerous to say the least but they are even more dangerous when signs are not within a person’s eyesight to show that the floor is wet. If there is no wet floor sign visible then the area becomes dangerous for public use. Public places can be very hazardous when the surface area of the flooring is wet; people or companies who own public spaces have a duty to ensure that they are safe for public use. It is fair to say that floors can become wet in many different circumstances and not all circumstances are foreseeable. Accidents can happen due to wet or contaminated floors causing a person to seriously injure themselves. Wet floors can happen in public places due a sudden change in the weather or a spillage at a restaurant or supermarket; however it is very important that such situations are dealt with in a timely manner so to eliminate any danger to the public. Spills and wet floors in public places must be attended to quickly. If this does not happen and a member of the public injures themselves as a consequence then they may be able to pursue a claim for wet floor injury compensation. A massive 35% of major injuries such as fractures and hospitalisations that occur in the food and drink industry are caused by hazardous wet floors. This is a huge problem for the food and drink industry as slips due to dangerous floors are more frequent in this industry than any other industry. There are estimated around 1,300 accidents in the food and drink industry regarding hazardous flooring, 80% being slips and 20% being trips. Injuries due to wet floors do not only happen in public places they can also happen at work, in work environments. Employers have a duty to keep their workplace safe for their employees to work in. It is very easy for floors to become wet and contaminated in many different areas of work. If you have slipped on wet floor at work that had no wet floor signs and could have been prevented then you may have a claim for wet floor injury compensation. The food and drink industry is obviously high in frequency slips for both employees and customers, but slips due to hazardous or wet floors can happen in a variety of workplaces. What is a Wet Personal Injury Claim? No Win No Fee Wet Floor Injury Accident Claims? How to make a Claim for Slipping on a Wet Floor? What can I Claim for after Slipping on a Wet Floor? How much Compensation could I receive for Slipping on a Wet Floor? I Slipped on a Wet Floor there was no Wet Floor Sign can I Claim? Places you can Claim Compensation for after Slipping on a Wet Floor. Supermarket Accidents – Have you Slipped on Wet Floor in a Supermarket? Accidents at work –Have you Slipped on Wet Floor at Work? 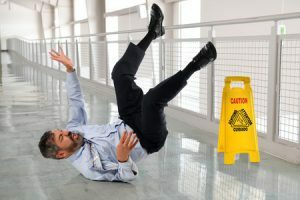 What is a Wet Floor Personal Injury Claim? Slips that happen due to wet floors can happen anywhere. If a person slips and injures themselves due to a floor being wet then they may have the right to make a claim for wet floor personal injury. Not all incidents of wet floor slips warrant compensation, however there are many that do. A person can pursue a wet floor injury compensation claim if they have had an accident due to the floor being wet that could have been prevented. A major cause of people injuring themselves due to wet floors is because there are no visible wet floor signs. Wet floors can be very dangerous often they are not visible to a person, it is very important in public places that if there is a spillage or the floor has been wet for any reason i.e. mopping, wet floor signs are clearly placed around the wet floor to indicate the danger. If the floor is wet but the appropriate measures have not been taken to highlight this and a person injures themselves as a consequence then they may be able to make a claim for compensation. It is fair to say that people still can injure or harm themselves on wet floors that have visible wet floor signs, however these are put down to an accident as the appropriate action has been taken to warn the public of the floor being wet. If you have slipped, or injured yourself due to wet floor that had no visible warning signs then you can make a claim for wet floor compensation as you have been injured through no fault of your own. A person or company who is in charge of a public place is responsible for the condition of the floor. Not all wet floor slips are foreseeable by the person responsible, however for those wet floor injuries that could have been prevented then compensation may be claimed. It is very important if you have had an accident due to a wet floor that you manage to acquire as much evidence as possible to facilitate your claim, i.e. images of the floor, whether wet floor signs are visible and how long you feel the floor has been left in this condition. Companies and people responsible can claim that they never had enough time to act so it’s vital to gather as much evidence as possible. We offer 100% No Win No Fee on wet floor injury compensation claims. If you allow us to represent your case of wet floor injury claims and we do not succeed you do not have to pay us a penny. No Win No Fee or conditional agreements as they are more commonly known are quite straight forward, if the case does not succeed then the client is not responsible for any of the fees. There was a law change during April 2013 that meant that solicitors’ fees were capped, and they could not recover all their costs from the opposing side meaning that they had to make up their fees from somewhere else in order to receive payment if the case was won. Solicitors now take a percentage from the compensation awarded to cover their reaming costs. This percentage is usually 25%. When a person is pursuing a wet floor compensation claim using a No Win No Fee agreement they can rest assure that they are not at any financial risk. We pursue all wet floor compensation claims through a No Win No Fee agreement, if the case does not succeed then you pay nothing. It is always highly recommended a victim of a wet floor injury appoints a personal injury solicitor that has experience with working with such cases as they will have the knowledge and expertise needed in order for a claim of wet floor injury compensation to reach its maximum potential. Using a solicitor to pursue any personal injury claim is vital for the claim to succeed as personal injury law can get complicated at times. Starting a claim for wet floor personal injury can be quite straight forward. We offer free, legal and confidential advice to those who want to pursue a claim for a wet floor injury but are not sure how to proceed. We always recommend gathering as much evidence as possible from the incident so that we can prove that the accident in reality could have been prevented meaning that the injury sustained could have also been prevented. By calling us today we can start your wet floor injury claim straight away. We will need some personal information such as name, address etc. We will also need to know how you was injured, what medical attention your sort and if you will continue to need any future treatment. Last but not least we will need to know where this happened and was it reported. Compensation that is awarded for an injury that is caused due to wet floor can cover arrange of aspects. Injuries that occur as a consequence of a person slipping on a wet floor can be quite severe, some injuries can also be life changing. Compensation can vary largely depending on the injury and how long that injury may last. These damages cover personal aspects of the victim’s life that has been injured. By and large special damages is mainly concerned with putting the person financially back into the position they was in before the injury was sustained, and any future expenses that may occur as a direct consequence of the injury. Any loss of earning, i.e. time off work which will be recuperated through special damages as well as any future loss of earnings or employment. The injury may be so severe that a person can no longer continue with their employment for the foreseeable future and may need to look for a completely new career. Any out of pocket expenses come under special damages, such as travelling costs to medical appointment, prescription costs, medical care any future rehabilitation costs. If people need their homes re-adapting after a wet floor injury that wasn’t their fault then such adapting will be covered under special damages. These damages are mainly concerned with the pain and suffering a person has suffered and may suffer in the future due to their injury. If a person has been injured through a wet floor and it has caused them an injury then when claiming compensation their pain and suffering will be taken in to consideration and in reality plays a huge part of how much compensation they are awarded. If the injury sustained is serious then more compensation is awarded obviously than if it is only a mild injury, how long the injury lasts, the prognosis also weighs heavy on how much compensation is awarded in terms of pain and suffering. Injuries that occur due to wet floor incidents that were foreseeable can range from mild injuries such as soft tissue damage and bruising to serious injuries such as fractures, even injuries to the head can occur. Compensation amounts for wet floor injuries or slips on wet floor can range drastically depending on the type of injury that is sustained. Injuries that occur due to a wet floor can range from bruising to fractures and even in the most severe circumstances life changing injuries. Amounts are given in regards to the severity of the injury and how long that injury is likely to last, compensation amounts also take in to consideration how much disruption the injury has caused to a person’s life. In the very early stages of a personal injury claim it is quite difficult to give a precise estimate to how much compensation will be awarded. A slip and fall compensation calculator may help when estimating how much compensation can be awarded in such a case. Estimates can be given using past cases that may be similar, but as no two cases will ever be exactly the same an actual figure is difficult to give. Personal injury compensation cases are always different; there will be similar aspects however people’s personal circumstances may differ, those with similar injuries may experience longer injury periods than others. Compensation amounts can change from person to person, below is a table that illustrates what past cases may have be awarded in terms of compensation however these are just to be used as guides and never to be taken as fact. Yes, is the most likely answer. Those who have slipped on a wet floor that has no visible wet floor signs to warn the public that the floor is wet may be able to put in a wet floor compensation claim. A person or company are responsible for public places, it is their responsibility to ensure that areas in which they are responsible for and that the public use are safe. However if the wet floor is unforeseeable or the responsible person has not had enough time to act, then it can be ruled that they have not been negligent. There is room for human error, owners and companies responsible for public places cannot always see dangers that may happen, or they need a sufficient amount of time in order to correct the problem. If the floor is just recently wet and it is deemed that the company have not had enough time to act, to put out wet floor signs and/or dry the floor then a claim may not be valid if an accident was to happen. However if there was wet on the floor that had been there for some time and no action had been taken to warn the public of the danger then it can be claimed that the company or person responsible had been negligent and had not been efficient enough in keeping the floor safe for public use, then a compensation claim for wet floor injury can be pursued. Warning signs placed around the wet floor before it can be dried are key to prevent any type of accident. By placing a wet floor sign indicating that the floor is wet can prevent employees, customers, visitors, the public etc from injuring themselves. Not all accidents that happen due to wet floors warrant a compensation claim, as they are not all foreseeable but for those times when spills are left or wet floors signs are not used appropriately the law allows those injured due to such negligence to be able to claim for injuries that are sustained as a consequence. Slip fall no wet floor signs may mean a person can pursue a claim if they injure themselves due to wet floor. There is a high probability that any injury could have been prevented with some type of warning sign. Slips due to wet floors or hazardous contaminated floors can happen almost anywhere. Shockingly 50% of slips that occur can be prevented, slips that occur happen due to floors being wet or having some type of product or substance on them. It is vital that public places as well as work places are constantly being managed for risks of wet or contaminated floors to prevent the public and employee from injuring themselves. Supermarket Accidents – Have you slipped on wet floor in supermarket? Wet floor injuries or contaminated floor injuries can very often happen at supermarkets. Rain water that has wet the entrance to a supermarket! If the rain had been on for some time and the entrance to the supermarket was really wet, causing a dangerously wet floor then it can be argued that they would have had sufficient time to put out wet floor signs to alert their customers of the wet floor. If a customer was to slip and injure themselves due to the wet floor they would be entitled to make a claim for wet floor injury compensation. In this instance the supermarket has been negligent. Slips due to wet floors can very easily happen in the workplace environments as well as public places. According to statistics slips and trips make up the most common cause of accidents that take place in the work place. People who work for a company, members of the public, contractors to companies, self employed staff etc are all equally likely to have an accident at work due to wet floor at a work place. Employers have a duty to keep their staff and any people who enter their premises safe including preventing accidents due to contaminated or wet floors. Floors being mopped in a group of offices, cleaner does not correctly put out wet floor signs so that employees and any members of the public are aware of the floor being wet. An employee slips causing injury to their body, needs medical attention and time off work due to the injury sustained. They now have the right to make a claim for wet floor injury compensation. A claimant was walking around a supermarket, she slipped on a wet floor. The CCTV recording was gathered as evidence to see how long the floor had remained wet. It was clear that the floor had not been attended to, no warning signs were there and therefore a clear danger to the public was present. The claimant fractured her ankle and received a compensation payout of £15,500 in damages. A waitress working in a restaurant slipped on boiling water in the kitchen, no visible wet floor signs anywhere and no attempt to clear the water. She was severely injured, suffering an injury to her back and was awarded £122,000. A long term injury, a doctor slips on a wet floor at a hospital, his ability to continue to work has been highly affected, even a career change may be compulsory. He was awarded £220,000 for fracturing his leg in multiple places, having multiply surgeries and huge loss of earnings. We offer a service that is tailor made for our customers so that each and every need they have is fulfilled. We fully appreciate that recovering after a nasty injury takes time, sometimes rehabilitation is a lengthy process that is why we ensure that we cover every area and aspect of all our cases, we do not leave any stone unturned ensuring that your personal injury claim reaches its maximum potential. Our solicitors have decades of experience working with many different cases of personal injury building up an empire of knowledge to be able to succeed in the most complicated of cases. We do not shy away from hard work; we welcome all personal injury cases and commit 100% to our clients.